A new generation of healthy formuations organic skincare, Grown ALCHEMIST Botanical Beauty is now available in KENS Apothecary. Their certified organic botanical ingredients and powerful natural actives provide a better beauty results without harmful artificial chemicals. 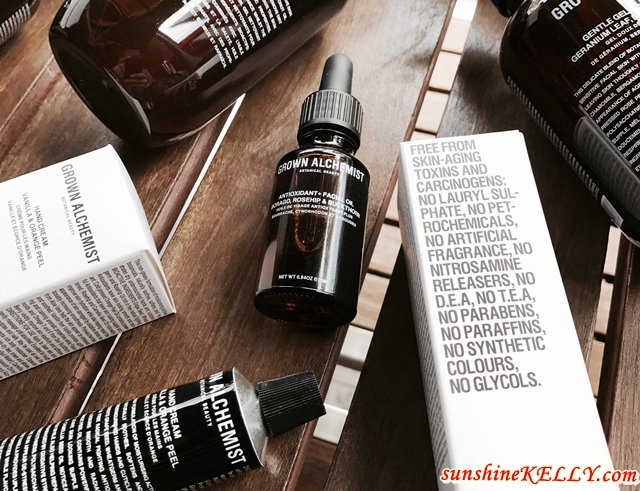 One of Grown ALCHEMIST products that I find amazing is their Antioxidant+ Facial Oil. According to the founders and brothers of Grown ALCHEMIST, Keston and Jeremy Muijs, the reason their products work so well is a matter of biology. The body recognizes the synergistic molecular structure of our uniquely natural formulae and utilizes it to regenerate beauty with superior results. Grown ALCHEMIST Antioxidant+ Facial Oil is potent organic facial oil is formulated using a powerful blend of Antioxidants, Vitamins and Essential Fatty Acids. These ingredients work in synergy to assist in restoring elasticity, reducing fine lines, firming, softening and smoothing skin, whilst boosting hydration and helping to protect against premature aging. Our bodies will naturally fight anything they regard as foreign or toxic, this reaction creates free radicals which we know greatly contributes to the aging process. Many synthetic ingredients, which claim to reduce the signs of aging, may in fact be doing more harm than good. Because their active ingredients are plant based, Grown Alchemist products are compatible with human biology. As you can see that all their packaging is very simple, elegant and using the material that is not harmful to our skin and health. Grown ALCHEMIST Antioxidant+ Facial Oil comes with a glass bottle and droplet that enables us to use the consistent amount for each application. For each application I use 2 drops and massage on my face, neck and décolletage in the evening after cleansing and toning. It is like anti-aging serum before my skin moisturizer. This Antioxidant+ Facial Oil can be used twice a day, morning and evening. The Antioxidant+ Facial Oil absorb very fast into my skin. My skin is moist and supple after the application. After using it for almost 2 weeks, I feel that my skin moisture is balanced and it helps to improve my skins barrier. I feel that my skin is not so sensitive and there is no allergy. Grown ALCHEMIST Antioxidant+ Facial Oil contains essential Fatty Acids, Antioxidants and Vitamin C from Rose Hip Oil and Sea-Buckthorn Berry fight free radical damage, promote cell renewal and support skin’s elasticity keeping it well-nourished and moisturized. Plus the Sweet Almond Oil and Rice Bran rich in Vitamins A, B1, B2, B6, & E and Oryzanol boost Collagen production and cell renewal to help tone, firm and repair the skin helping to prevent and reduce the appearance of fine lines and age spots whilst giving a natural radiance to the complexion. Overall for those who love and believe in organic skincare, Grown ALCHEMIST Antioxidant+ Facial Oil is a stable anti-aging serum for your skin. It’s suitable for dry, dehydrated and also mature skin. If you have breakouts you might want to avoid using oil products. For best results, use the Antioxidant+ Facial Oil together with their Gentle Gel Facial Cleanser and Balancing Toner. Price: Grown ALCHEMIST Antioxidant+ Facial Oil is retail at RM220 for 25ml. Availability: Grown ALCHEMIST Antioxidant+ Facial Oil is now available at KENS Apothecary online and stores. Origin: Grown ALCHEMIST is Made in Australia. I have not heard of Grown ALCHEMIST till now. Interested to do some further research on them! For something great, I guess the high price is guarantee of its worth. Still, way out of my reach for an amount of 25ml.